“Hi, are you an exchange student?”, “So you are here for exchange?”, “Why do you choose CityU for exchange?” Well, these are some common questions asked by the students when they see foreign students on campus. However, students rarely recognise the international students around them. Indeed, these students wish to be known as international students rather than exchange students. Let us explore Ralph Aurel TIGOUMO (Chinese name: 纪建德) (Year 1, BBA Quantitative Finance and Risk Management, living in Hall 7) from Cameroon. Ralph was once a student at Xidian Keda ( 西电科大), China, where he discovered that Hong Kong is a better place to continue his tertiary education. He applied to most of the universities in Hong Kong and was accepted by CityU with scholarships. 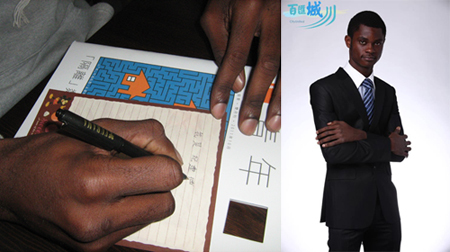 His peers are amazed by his Putonghua-speaking ability as a black overseas student. Being an active student, he has been very proactive in participating in school activities. One of the most memorable experiences for him is his involvement in the election of the CityU Students' Union. From nothing to gaining experience and friendships with local Hong Kong students and students from Taiwan and China, it was a very challenging task for him to communicate and build trust. He also noticed some important differences between the ways that different Chinese act. For instance, he described Hong Kong students as very “open-minded” and students from China as “keeping more to themselves”. Sometimes, he finds it easier to get along with international friends than with the locals. Rather than sharing personal thoughts in daily life, Ralph has found that topics with the Chinese are mostly about formal issues in society, rather than chatting about girls or jokes. Nevertheless, CityU student residence has been a very good platform to learn about local Hong Kong culture. He can describe his life in CityU with one word: FUN! When asked whether he misses home, he said, “I never miss home. Being here just opens up a lot more opportunities”. He always believes “There are no greater riches than man and relationships”. That is the most unforgettable advice from his Mum. He aspires to be a successful entrepreneur, so wish him luck!